Solarstone’s Pure Trance movement has aimed to redefine the trance landscape since its inception in 2012, by opening up new possibilities for the underground scene. Its newest extension is the Pure Trance Progressive label – focusing on promoting the resurgent deeper, slower, highly creative side of the sound. In the final days of 2015 the label released Forerunners’ ‘Lost In Translation’/ ‘Strange Days’, two progressive pieces of music, courtesy of Arizona-based producer Brenden LaBonte. This was a release that apparently broke down sub-genre barriers for a lot DJs around the world, gaining attention when played in melodic techno sets, deep progressive sets, and slower trance sets. PTP aims to release immersive and unique tracks that continue this trend throughout 2016 and beyond. Italy’s Gai Barone is a producer that tries to produce his own unique sound and with his recent ‘Towards’ album release, his profile has risen and has seen him playing at possibly some of the world’s most iconic underground clubs. 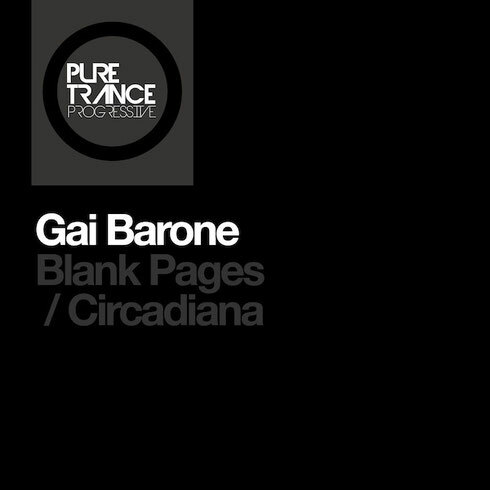 ‘Blank Pages’ is taken from Gai’s own disc from the new ‘Pure Trance Vol. 4’ album, and is an example of his production skills, as he layers sounds and patterns with an instinct to create something that sounds different. ‘Circadiana’ continues the progressive melodic theme, entwining expressive arpeggiated sequences and keyboard movements into an immersive soundscape.